Anyway all this warm sunny weather has me thinking of lots of outdoor activities and yes most of them involve FOOD! My sister recently posted Veggie Bean burgers, I posted about onion rings not too long ago; both would be great items in an outdoor BBQ or picnic! As we get into Spring and Summer I will try to give you lots of Simple, Healthy, Tasty ideas for great outdoor eats! So it will be easy for you to attend Family Reunions, BBQ's, Picnics, etc. and still eat healthy! First off I must post one of our very most favorite outdoor BBQ dishes! We call them VeggieKabobs and they are so very, very good! ENJOY! Let Veggies soak in marinade in the fridge overnight! During the next day before time to put them together I will usually stir them a few times. Soak skewers a few hours before cooking. 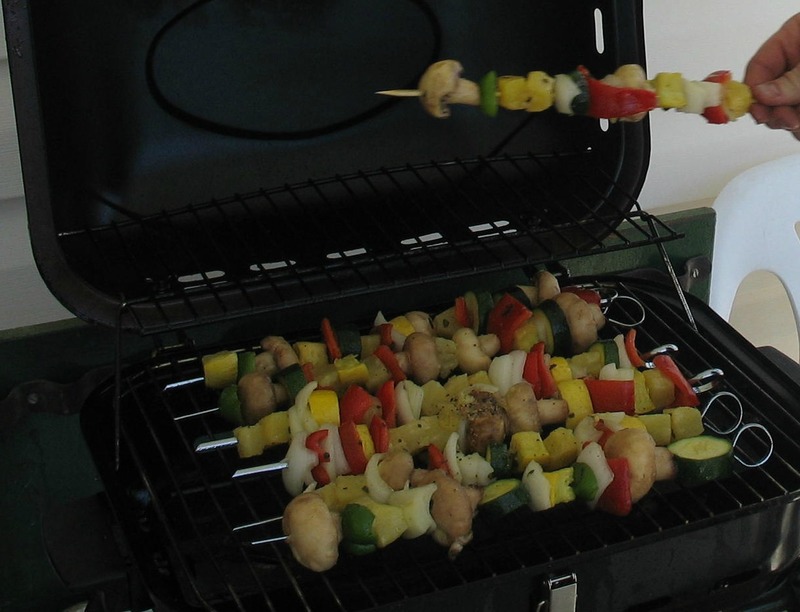 Take soaked skewers and put the veggies on rotating them so you have a good variety. Place on warmed grill. Don't cook too hot or you will burn the outside. Be patient and slowly let these grill turning a few times getting that nice smoky flavor. Cook just until warmed with some grill marks on the outside. You want your veggies to still be crunchy. You may brush them with more marinade while they are grilling. Also the left over marinade makes a great salad dressing and I like to put it on some cooked whole wheat spaghetti with a little coconut oil and more lemon pepper added. It goes great with the grilled veggies! I love this marinade of yours on our asparagus...so tasty! One more question- What do you think of Agave Nectar... my Mom read me an article from a weight watchers magazine and it seemed to say that Agave was no different than High Fructose Corn Syrup, mainly because it was so highly processed. And the article also said that when given to diabetics they passed out and had to stop the study, which is opposite to what the label says. Courtney: With Sunscreen like with everything I READ INGREDIENTS. I think most sunscreen causes more cancer then the sun ever did! I have found some sunscreens at the health food store that work pretty good but they don't rub in very good an usually leave my sensitive skin with a rash. Still rather have a rash then the chemicals. But I have started trying a sunscreen that I think I will really, really like once I learn how to best use it. It's called Sunset by Be Young (www.beyoungeo.com/4050) I used it last weekend when I got burned. But I noticed that places like my face and arms where I put enough on ended up tanning quite nicely! It was my shins that I barley sprayed any on that got burned. About the Agave. I have been reading some of the controversy on that. I would like to read the article about the diabetics. Did it say the brand of Agave they were using? I do use some Agave but I try to find the Organic, DARK kind. You won't see me buying that light stuff that Wal-Mart now sells of course I don't usually buy honey from them either I have heard it can sometimes be dilluted with corn syrup. I buy my honey raw from the co-op. Like with any sweetener I would not overuse it and I would be sure to find the darkest kind just like with Sucanat, and your higher grade maple syrups it must have more nutrients and minerals if it is that dark. Again read ingredients and be sure they didn't just put carmel color in it. I have heard there are some questionable practices going on with the production of Agave because of it's popularity now. Be sure to get a brand you TRUST. And then pay attention to how it makes you feel maybe it is like what Dr. Mercola's website says and we shouldn't be eating it at all. For now though I'm still okay with a little now and again of the DARK kind from a trusted company. This is proably a good question for Green Smoothie Girl. She is great at researching companies and finding acurate stats on things!